Do I need a fishing license to fish at Lake Anna? The answer is...yes. The good news is that the state of Virginia now offers fishing licenses online at gooutdoorsvirginia.com. You'll also find that most Lake Anna marinas also offer fishing licenses. Which bridges can I fish from? Fishing is prohibited from the bridges at Lake Anna, however, there is a public fishing area at Dike 3 on Moody Town Road in Bumpass. The water is notoriously rough there, so please use caution if you decide to cast a line in this area. Lake Anna is home to a variety of fish that are fun to catch and delicious to eat. Species include, Largemouth Bass, Striped Bass, Black Crappie, Bluegill, Channel Catfish, Walleye, & White Perch. Along with fish, there are quite a few fishing guides local to Lake Anna that are more than willing to show you the ropes! For the past 10 years, this fishing guide has been developing his skills as a Tournament Bass Fisherman, and a Fishing Guide for Crappie, Striper, and Largemouth Bass, and is also a part of Central Virginia Outdoors. 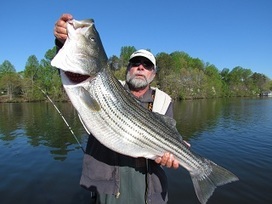 A guide for Central Virginia Outdoors, he strives to be on the water 4-7 days a week, beginning at Sturgeon Creek Marina and also welcomes fishermen of all ages and skill. The Lake Anna Striper Guide service, works full time fishing exclusively for Striped Bass that fish out of High Point Marina. For more information, check out Virginia's Freshwater Fishing Regulations page.